The month of February recognizes American Heart Month, National Wear Red Day, World Cancer Day, Congenital Heart Defect Awareness Week, National Donor Day, and National Heart Valve Disease Awareness Day. Since 1963, February has been celebrated as American Heart Month to urge Americans to join the battle against heart disease by committing to a healthy lifestyle and making small changes that can lead to a lifetime of heart health. Heart disease is the leading cause of death for men and women in the United States. Every year, 1 in 4 deaths are caused by heart disease. Nearly half of Americans have at least one risk factor for heart disease , such as high blood pressure, obesity, physical inactivity, or an unhealthy diet. Risk also increases with age. The most common type of heart disease is coronary artery disease (CAD), which can lead to a heart attack. Since 2004, February also has been the signature month for the American Heart Association’s (AHA) Go Red For Women campaign with a strong message that heart disease is not only a man’s problem. According to the AHA, heart disease is the No. 1 killer of women, causing 1 in 3 deaths each year. That’s approximately one woman every minute. The Go Red For Women movement advocates for more research and swifter action for women’s heart health. Friday, February 1, 2019, is National Wear Red Day®, designed to bring attention to a disease that is claiming the lives of nearly 500,000 American women each year. Schedule a visit with your doctor to talk about heart health. It’s important to schedule regular check-ups even if you think you are not sick. Partner with your doctor and health care team to set goals for improving your heart health, and don’t be afraid to ask questions. Eat healthy. Cook heart-healthy meals at home at least 3 times each week and make your favorite recipe lower sodium. For example, swap out salt for fresh or dried herbs and spices. Take steps to quit smoking. If you currently smoke, quitting can cut your risk for heart disease and stroke. Learn more at CDC’s Smoking and Tobacco Use website. A truly global event takes place every year on February 4—World Cancer Day—uniting people all over the world against a disease that knows no borders. This day aims to save millions of preventable deaths each year by raising awareness about cancer. Coordinated by the Union for International Cancer Control (UICC), World Cancer Day is a reminder that everyone has the power to take action to reduce the impact that cancer has. Everyone can take steps to reduce their risk of cancer by choosing healthy options including quitting smoking, keeping physically active and choosing healthy food and drinks. Diagnosing cancer isn’t always easy – not all cancers show early signs and symptoms and other warning signs appear quite late when the cancer is advanced. However, for a number of cancers, increasing awareness of signs and symptoms and the importance of timely treatment has been shown to improve survival from cancer. This is because finding cancer early almost always makes it easier to treat or even cure. Maintaining social support networks and talking about cancer can be important strategies for coping with the social and emotional impact of cancer, both in the short and long term. People-centered care requires that all patients have the education and support they need to make decisions and participate in their own care across the entire cancer journey. Empowering patients to do whatever they need to regain a sense of control and preserve their dignity throughout their cancer journey can help them manage the changes cancer brings to their lives. For more information, visit www.worldcancerday.org. Congenital Heart Defect Awareness Week, held February 7-14, 2019, is an observance to promote awareness and education about congenital heart defects (CHDs). February 14 is Congenital Heart Defect Awareness Day, an annual campaign to honor and remember everyone born with a heart defect and all of the families and friends touched by children with heart defects. In addition, the medical professionals who care for those born with heart defects are recognized on this day, as are the experts who are involved in conducting research for treating and preventing heart defects. CHDs are conditions that are present at birth and can affect the structure of a baby’s heart and the way it works. They can affect how blood flows through the heart and out to the rest of the body. CHDs can vary from mild (such as a small hole in the heart) to severe (such as missing or poorly formed parts of the heart). According to the American Heart Association, congenital heart defects are the most common type of birth defect. 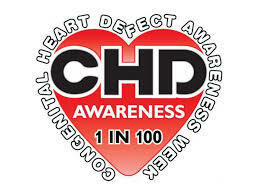 CHDs affect 1 out of every 100 newborns. Some CHDs may be diagnosed during pregnancy using a special type of ultrasound called a fetal echocardiogram, which creates ultrasound pictures of the heart of the developing baby. However, some CHDs are not detected until after birth or later in life, during childhood or adulthood. If a healthcare provider suspects a CHD may be present, the baby can get several tests to confirm the diagnosis. Treatment for CHDs depends on the type and severity of the defect present. Some congenital heart defects in children are complex and may require several surgeries performed over a period of many years. Some can be treated without surgery. Sometimes, the heart defect can’t be fully repaired, but these procedures can improve blood flow and the way the heart works. Read more about congenital heart disease here. Observed each year on February 14, National Donor Day (also known as National Organ Donor Day) is a day to increase awareness about organ donation and the lives that can be saved. In the United States, there are close to 120,000 people waiting for a life-saving organ donation. According to Donate Life America, another person is added to the waiting list every 10 minutes, and 22 people die each day waiting for an organ. National Donor Day focuses on five different types of donations: Organs – Tissues – Marrow – Platelets – Blood. Many nonprofit health organizations sponsor blood and marrow drives and organ/tissue sign-ups across the nation. Look into becoming a donor. Visit RegisterMe, Donate Life, and OrganDonor.gov for more information on organ donation. February 22, 2019, is National Heart Valve Disease Awareness Day. This observance day is dedicated to raising awareness about heart valve disease (HVD) and its risk factors, symptoms, detection, and treatment. As many as 5 million Americans have been diagnosed with HVD, which involves damage to one or more of the heart’s valves. While some types are not serious, others can lead to major complications—including death. Most HVDs involve a damaged valve that disrupts blood flow by not opening or closing properly. Regurgitation is when a valve does not fully close and allows blood to leak backwards. It is also commonly called insufficiency, or a leaky valve. Stenosis is when a valve does not fully open to allow enough blood to flow through. It is also commonly called a sticky, narrowed, or stiff valve. Each of the four valves can have regurgitation or stenosis (sometimes both), although the aortic and mitral valves are most likely to be damaged. HVD can be there at birth, or develop later in life from calcification, other cardiovascular diseases and conditions, or infection. Age is the greatest risk factor with 1 in 8 people ages 75 and older estimated to have moderate to severe HVD. However, people with HVD do not always have symptoms, even if their disease is severe. For these people, a heart murmur is the most important clue. Each year, an estimated 22,000 people in the US die from HVD. For patients with severe aortic stenosis, their survival rate is as low as 50% at 2 years after the onset of symptoms and 20% at 5 years. Fortunately, valve disease can usually be successfully treated with valve repair and replacement in patients of all ages. The Alliance for Aging Research, who sponsors the National Heart Valve Disease Awareness Day, reports that a recent survey of more than 2,000 adults in the US found that while over half have heard of HVD, less than one in four know somewhat or a great deal about HVD. Although awareness increases with age, 30% of respondents over the age of 65 say they know nothing about HVD. The seriousness of HVD, combined with the fact that disease symptoms are often difficult to detect or dismissed as a normal part of aging, makes this lack of awareness dangerous. The goal of the National Heart Valve Disease Awareness Day is to increase recognition of the specific risks and symptoms of HVD in order to improve detection and treatment—and ultimately save lives.